$30,000 Kalimoni Mission Hospital, a faith based institution situated at the outskirts of Nairobi (45km) takes care not only of the health needs of the people they serve but also, their social and economic needs. We conduct seminars for the youths of the community during the holidays and provide food, clothing and medical care for 30 very needy families consisting of about 85 members. The institution is still very small with poor infrastructures. We therefore need assistance to construct a hall for meetings, seminars and conferences. We intend also to engage in some agricultural work like poultry farming, and a vegetable garden to enable us provide the most needed help to the people we serve. 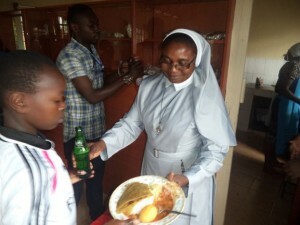 Sr. Juliana Mose HHCJ, a missionary in Kenya and the administrator of Kalimoni Mission Hospital, has a passion not only for the sick but also for the underprivileged, the aged and the youths. Any assistance given to her will be judiciously utilized for the needy. My donation is in the name of Sr. Gertrude Majani. "YOUTHS' CONFERENCE HALL IS A FELT NEED,"